You can connect your ShipWorks account with Brightpearl at no extra cost, enabling you to effectively manage customers, inventory and orders from multiple sales channels whilst connecting directly with your shipping carriers. Brightpearl handles your order processing, which includes downloads from your ecommerce store(s), telephone sales, B2B sales, Point of Sale and so on. If you have goods to ship to a customer you create a goods-out note in Brightpearl from the order. The goods-out note contains the delivery information and the details of the items (weight, price etc). It’s the goods-out note which is downloaded by ShipWorks where you can then process the shipment with any of the carriers you have set up. Once the order has been processed in ShipWorks it will notify Brightpearl providing details of a tracking reference if relevant. When Brightpearl is notified of the shipment the order shipping status is updated, the inventory levels are reduced and the relevant accounting entries are made. What version of ShipWorks do I need? You will need to be on at least ShipWorks version 3.0 for the integration with Brightpearl to be supported. Fulfill orders to goods-out notes in Brightpearl. Print the goods-out notes in Brightpearl. Process the shipments in ShipWorks. Invoice the order in Brightpearl. Brightpearl is going to be your central order processing system, potentially receiving orders through multiple sales channels. Each order begins life in Brightpearl and must be fulfilled to a goods-out note. And it's the goods-out notes which are downloaded into ShipWorks. The current time is used for release date/time. Note : Every sales order must have a delivery name and address. If these are missing the goods-out note will be rejected by ShipWorks causing the whole download to fail. Click “Download” in ShipWorks; all Brightpearl goods-out notes where the release date is after the last download time stored in ShipWorks will be collected. Ship your orders in ShipWorks and the goods-out notes in Brightpearl will automatically be marked as shipped. Remember that once shipped, you can’t delete a goods-out note! If an order needs to be partially shipped it should be split in Brightpearl so that a goods-out note is created for each shipment. Each goods-out note will be downloaded into ShipWorks for shipping separately. If an order is split in ShipWorks it will not update the goods-out note in Brightpearl. Partial/advanced fulfill only - If you choose a release date other than today, then 0100 (1am) will be used. If you create multiple shipments for one ShipWorks “order” (remember these are goods-out notes in Brightpearl), then you have the opportunity to enter two different carriers and tracking references. Since ShipWorks marks the Brightpearl goods-out note as “shipped” when the first is processed, the second will update in ShipWorks but will give you an error when it attempts to update Brightpearl saying that the shipment is “already shipped”. If you are planning to split a goods-out notes into multiple consignments each with their own tracking reference, you should be splitting the order in Brightpearl (using backorders or partial fulfillment) in order to create multiple goods-out notes which will all be uploaded to ShipWorks. Orders can be combined within ShipWorks but the Brightpearl goods-out note will not be updated since the ShipWorks reference will change. Once a goods-out note is downloaded from Brightpearl and into ShipWorks it is an independent record, so canceled order needs to be deleted in ShipWorks as well as the goods-out note in Brightpearl. A shipping method must be assigned to the Brightpearl order or goods-out for it to upload to ShipWorks . You will need to create your shipping methods in Brightpearl, these will appear on the order in ShipWorks. You can even apply your mapped ShipWorks shipping methods by using the same name in Brightpearl as in ShipWorks. You can print pick lists from either Brightpearl or ShipWorks - the format is virtually identical. However, the Brightpearl warehouse location will not be transferred to ShipWorks , so you’ll need to add them manually in ShipWorks. We are looking at transferring inventory locations to ShipWorks in a future release. Orders are shipped in ShipWorks. Once an order is marked as shipped in ShipWorks the order shipping status will be updated in Brightpearl and details of the shipment are added into the order notes and history, including any tracking reference assigned in ShipWorks. You can set your ShipWorks account to send any email you like, and change the email template. You can also use Brightpearl to let customers know that their order has been packed, when you pack the goods-out notes from the Brightpearl screens. Find all orders in Brightpearl that are now “fully shipped” (the truck icon will be colored) using the filters in the Sales menu. This is normally the point at which you’d invoice the order. Invoicing an order will prevent you from adding or removing products, so it’s good to leave this until the last step. Currently the ShipWorks app only supports a single Brightpearl warehouse (all goods-out notes will be downloaded). 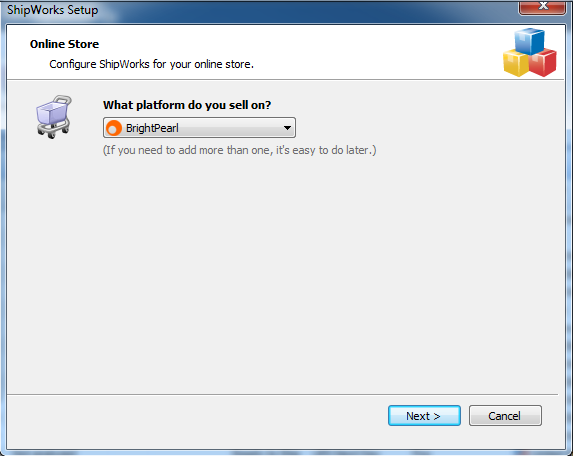 You can however set up multiple stores in ShipWorks if you want to download goods-out notes from multiple Brightpearl accounts. These settings tell ShipWorks to update Brightpearl when a shipment is processed. They are correct by default, but if you find that ShipWorks has stopped updating Brightpearl, then check all is OK here: ShipWorks > Manage > Actions. You should have an action to “Online-Update” when a shipment is processed. If you want you can update Brightpearl only on certain carriers. By default it only updates normal shipments (not return shipments). ShipWorks connects to Brightpearl via a Brightpearl staff member (this will be changing soon but we will let you know when it does). This staff member won't use up one of your user licences you subscribe for so won't prevent anyone from logging in. In ShipWorks a store is created for each Brightpearl account that you want to connect. Go to Settings > Staff/Users and click to add a new staff member. Name your staff member, such as “Ship Works”. Enter an email address and keep a note of it, you'll need this later to enter in ShipWorks. It needs to be different form all your other staff members and company email, but it doesn't need to be real. Save the staff member and now give them a password by clicking on the Password link next to their record. Keep a note of this too as you'll need it later. Make sure this staff member has API access, so in the staff list look for a green check mark in the API column next to this new ShipWorks staff member, this means API access is authorized. If you see a cross, click on it to change it. 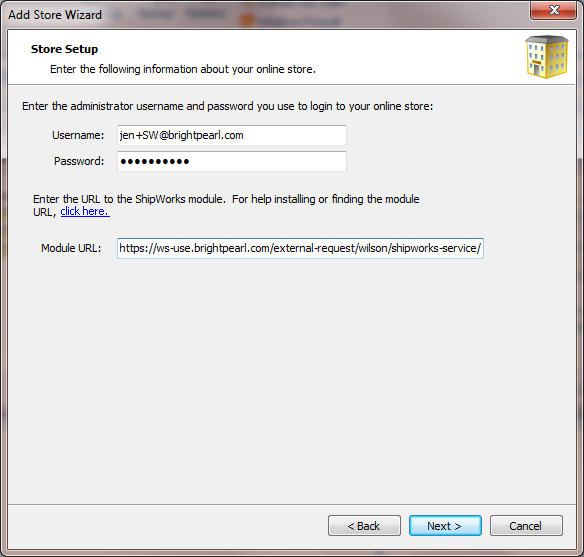 In ShipWorks, go to Manage > Stores and add a new store - a separate store is required for each Brightpearl account you connect. In the store set up, select Brightpearl as the platform. Now enter the ShipWorks staff member from Brightpearl - enter the email address as the username and then the password . You'll also need to enter the Module URL, this is what ShipWorks needs in order to find your Brightpearl account, just like you need to go to the log in screen. The URL you need will be different depending on which data center your Brightpearl account is held in, and this is different depending on where you are located. You can see which one you need by checking the URL while you are logged in to your Brightpearl account. Note : Replace "yourAccountCode" with your own Brightpearl account code. Click Next , and then enter your store information. Once you've finished adding your store, in ShipWorks go to Manage > Shipping Settings . From the General section, select the Global Settings tab . Click to add a new origin - this will be the warehouse that you’re using ShipWorks in. Enter your warehouse details and click OK . In the same window, set up any carriers that you have arrangements with. If you want to test the system with a dummy carrier, then use provider “Other” when you create shipments later. That's it! Your Brightpearl account is connected to ShipWorks and ready to sync.